Wonderfully zingy. Greek feta, tender spinach. A hint of lemon and mint. Camilla's all-butter puff pastry. Sprinkled with polenta & kale. Vegetarian Society approved. A no-time-to-think Midweek Lunch... These Spanakopita rolls A thrown-together Greek salad A tub of minty Tzatziki How's that for a work/reward ratio? 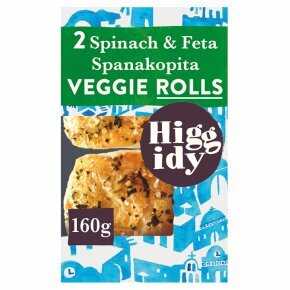 These rolls are ready to eat cold but taste best heated up.Preheat oven to 180°C/350°F/Gas Mark 4.Remove all packaging & place on a tray on the middle shelf of the oven for about 10-12 minutes. This is a guide only (some ovens vary).Do not reheat once cooled.